Chris Petersen: "There’s still another guy or two that we have our eye on that we feel pretty good about." 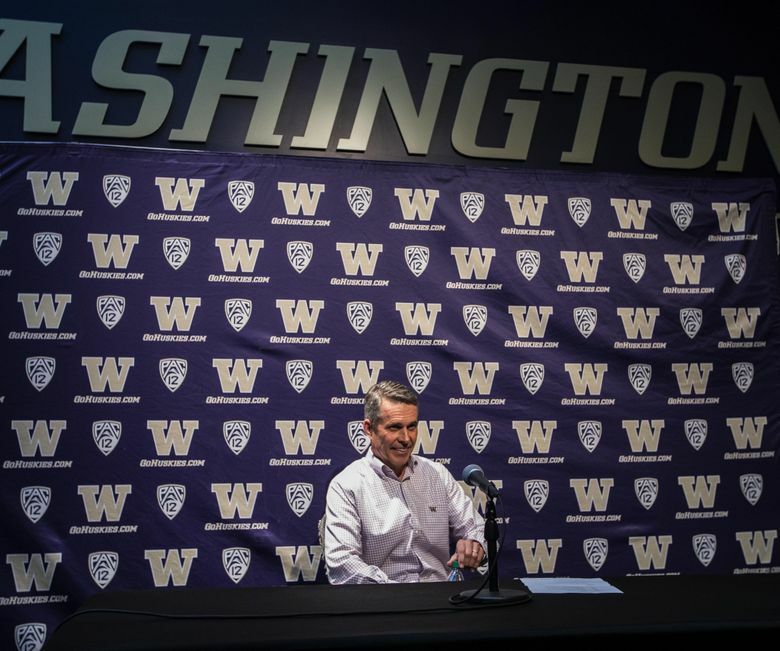 The early returns on college football’s new early signing period could not have been much better for the Washington Huskies. Chris Petersen, indeed, has never had a recruiting day quite like this. And if this is it — if the 18 recruits the Huskies signed Wednesday are all they get in the 2018 class — Petersen would be quite content with a haul that could go down as the most acclaimed class in program history. After the first day of the early signing period, the recruiting site 247sports.com ranked UW’s class No. 1 in the Pac-12 and No. 11 nationally. And yet, after another largely anticlimactic signing day Wednesday, there is much anticipation for more Thursday and, perhaps, beyond. The Huskies, 10 days away from playing Penn State in the Fiesta Bowl, signed eight recruits with a four-star ranking on Wednesday. They’re in the mix for at least two more four-stars, and one of those recruits — cornerback Kyler Gordon out of Everett’s Archbishop Murphy High — plans to announce his choice during a KING5 broadcast at 7 p.m. Thursday. Gordon will choose between the Huskies and Notre Dame. The Huskies are also thought to be in the mix for junior-college defensive lineman Caleb Tremblay (Sacramento) and safety Julius Irvin (Anaheim, Calif.), both four-star recruits. As things stand, it’s a dynamic class — the highest-ranked class Petersen has signed. This is his 13th recruiting class as a head coach, fifth at UW. It’s difficult to pick one recruit, or one position, to highlight. Let’s start with the quarterbacks. What Petersen and the Huskies did there — landing two top-100 QB recruits — is rare air. In getting Bothell’s Jacob Sirmon and Colson Yankoff of Coeur d’Alene, the Huskies are believed to be the first NCAA program to sign two top-100 QBs since Florida in 2007 (Cam Newton and John Brantley). Sirmon, way back in December 2015, was the first recruit to commit to UW’s 2018 class. Yankoff made a verbal commitment last March. Keeping both in the fold, even while understanding that it would seem almost impossible for both to fulfill their dream of becoming the Huskies’ starting QB, had to be a delicate recruiting dance for Petersen and his staff. Petersen didn’t offer much in how he made that work, beyond being encouraged about the attitudes and maturity of both youth quarterbacks. Sirmon, a big and strong-armed, is a pro-style passer who has been studying off and on with UW coaches for more than a year. ESPN ranks him as the No. 30 overall prospect in the nation. Yankoff, big and nimble, is a dual-threat who could offer an intriguing wrinkle to Petersen’s offense. 247sports lists him as its No. 75 overall prospect. The three wide receivers signed Wednesday — Trey Lowe, Austin Osborne and Marquis Spiker — could be among first from the 2018 class to play as true freshmen next fall, in part because of their apparent talent and in part because the Huskies need another playmaker or two on the perimeter. Spiker, ranked as the nation’s No. 29 overall prospect by rivals.com, is the highest-ranked recruit Petersen has ever signed. Sirmon (No. 30, ESPN) and linebacker Ale Kaho (No. 32, 247sports) are right there, too. Kaho, who chose the Huskies over an offer from Alabama, made his commitment Saturday while on an official visit to UW with his parents. “Recruiting can be hectic and you have all sorts of parties coming in and kind of muddying the waters and all that, and it gets confusing for everybody,” Petersen said. “When we were able to get him and his parents back out here on an official visit, I think he was one of the guys from the start. He just knew in his heart this is where he wanted to come.